As with almost everything else for our wedding, I decided to do our own flowers. Part of my reasoning was that I wanted both the bouquets and the table centerpieces to look mismatched, informal, and wild. The other part of my reasoning was the fact that wedding florists are not cheap. At all. It ended up being such a fun project, gave us creative freedom, and was so much easier than I'd thought. We also saved a ton of money by doing them ourselves. 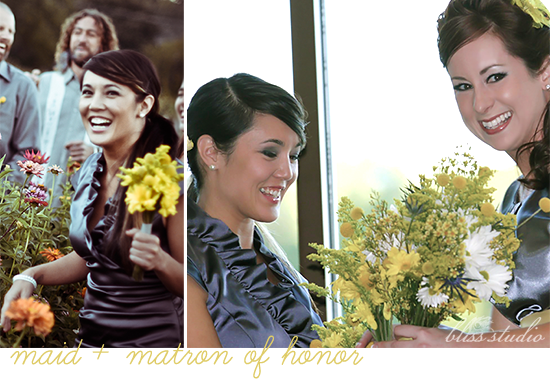 Our wedding colors were yellow and gray, and I absolutely adore yellow flowers. I always have. Seeing yellow wildflowers growing instantly lifts my mood and makes me think of summertime. I decided soon after we got engaged that we'd have a flower errand running day a couple of the days before the wedding, grab any and all yellow flowers that we could find at local markets and florists, and improvise. Instead of roses or traditional wedding flowers, I really wanted to create arrangements that looked "just picked." We also wanted as many locally grown flowers as possible. My favorite flowers have been daisies since I was a little girl, so I hoped to include some of those, along with some fresh greens. I'm also mildly obsessed with billy buttons/craspedia, and really wanted to use them as the main flowers for the corsages and boutonnieres. I knew they would be really difficult to find, so I broke down and ordered some online in advance. They were the only flower that we didn't get locally. Two days before the wedding, as my Maid of Honor Jen and I sat on my living room floor drowning in last minute projects, my mom and Robbie's mom went on a flower treasure hunt around town. 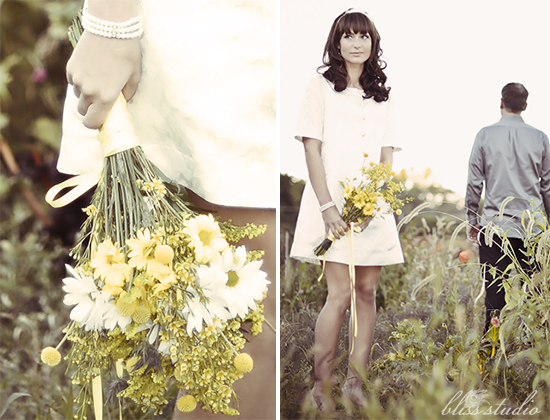 They brought back an incredible mix of yellow and white daisies, goldenrod, mustard, thistle and greens for the bouquets. They also picked up some beautiful spider mums for the table arrangements, and pots of yellow chrysanthemums to place throughout the venue. My dear friend Sara who had flown in early from California came over, and she, Jen, and I came up with designs based on the flowers we had. Jen and Sara did almost all of the work putting the bouquets together while I finished up printing the programs and making banners. They did such an unbelievable job, and it only took a couple of hours to make 6 bridesmaid bouquets, 2 mini bouquets for the junior bridesmaid and flower girl, my bouquet, 15 boutonnieres, and 7 corsages. To make them, we arranged the flowers, cut off the ends, and wrapped green floral tape around the stems to hold them in place. We left the stems long enough that we could set the flowers in water until Saturday. On the morning of the wedding, we trimmed the ends of the stems, wrapped them in gray ribbon over the floral tape (yellow for me and the little girls), and secured the ends of ribbon with a hot glue gun. Tip: if you don't have a hot glue gun, use floral pins to secure the ribbons. We then used floral pins to pin the corsages and boutonnieres on to the groom and groomsmen, ushers, parents, grandmother, officiant, and guests of honor. For the table settings (designed by my mom! ), we used different sized jars and arranged the flowers in them, keeping the same "just picked" look that we created for the bouquets. 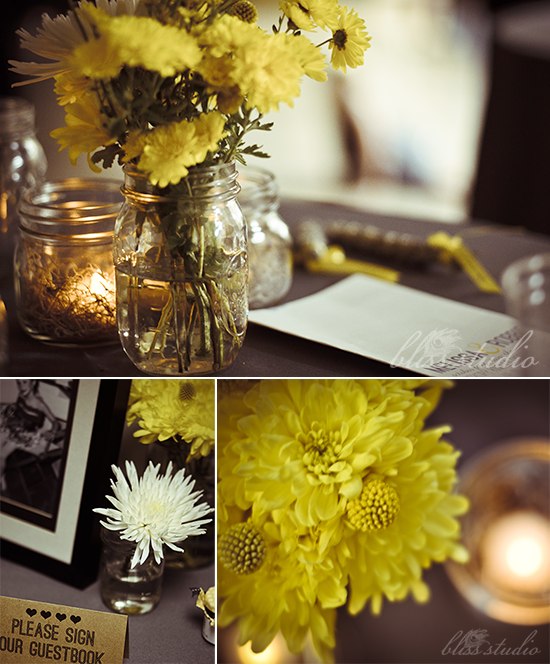 In addition to the dinner tables, there were flowers in mason jars throughout the venue. My favorites ended up being the simplest: the jars that each held one single spider mum. So elegant. Our flowers even ended up being the inspiration for an impromptu art project by two incredibly talented and dear friends of mine: Jeff, a Seattle-based muralist/graffiti artist, and Taylor, a Manhattan-based graphic artist. We were supposed to have our ceremony outside, but it ended up being the first cold day of the season, and had to be moved inside last minute. To bring some life to the very neutral room where we held the ceremony, Jeff and Taylor created a breathtaking installation the morning of the wedding. It was so magical and kind of them that it made me cry. The story behind the art is deserving of its own post, so I'll save it for later in the week. If you're planning a wedding or event and like D.I.Y. projects, I highly recommend creating your own bouquets and arrangements. I don't think I could have possibly been happier with our flowers, and we had so much fun making them ourselves. I was worried that we wouldn't be able to find all the flowers we'd need or that they'd take more time than we had to arrange, but everything turned out perfectly - even better than I'd envisioned. P.S. Big thanks to our friends Amy and Lynne at Bliss Studio for the beautiful photography! They look perfect! Love the "just picked" idea and the simple arrangements. i like the wildflower feel of your bouquets. :) well done! I think they turned out beautifully!! great job! I love flowers and the fact that it was a d.i.y! Your wedding looks absolutely stunning. Yellow is definitely my favorite color, it's gotten me all inspired now! I'm a new follower/fan of your blog! And we even share the same name :] Can't wait to check out some of your other posts! 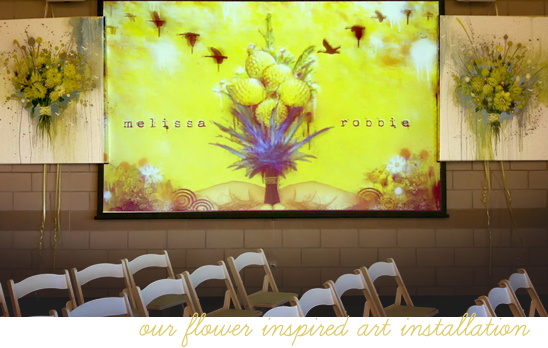 Melissa, I so love your handmade wedding and I am sure the preparations have played an enormous role in the memories left for you and Robbie. I can't wait to read more and more! Your flowers are so cute! I love the look of wildflowers. I wanted to do the same thing, but I happened upon a florist in town that purchases the flowers and then we come into his shop and arrange them ourselves--so they're semi-homemade. I'm using billy buttons also (with gerber daisies). P.S. I quite enjoy all these little wedding posts you're doing! Gorgeous flowers- I love that you made your own! Getting flowers done for your wedding can be so expensive- and yours are as lovely as any flowers I've seen! Some of the prettiest wedding flowers I've seen. I love wildflowers, but they don't last long after they've been picked. 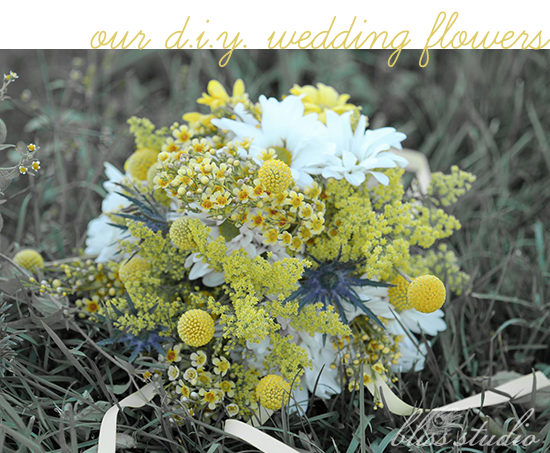 We used a lot of queen anne's lace for my son's wedding....picked that morning in a field.